American Weldquip, Sharon Center, Ohio recently introduced a new enhancement to its “Cool Grip” water-cooled semi-automatic line up. 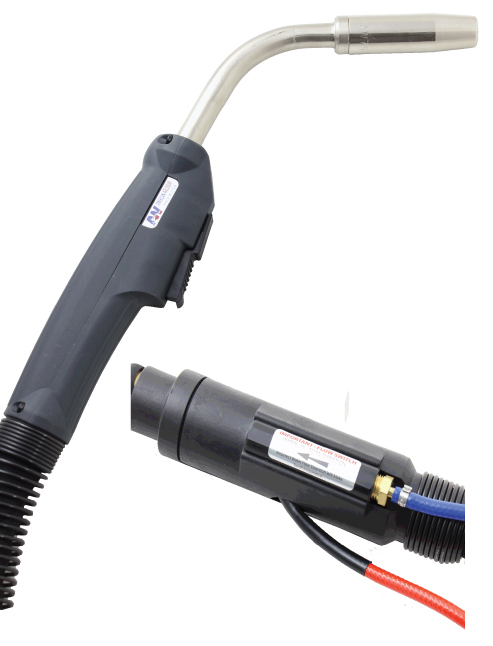 All water-cooled “Cool-Grip” semi-automatic torches will now be manufactured and shipped standard with a built-in water flow switch. The integrated flow switch protects the torch and components against low or no water flow conditions. If low flow is detected the trigger circuit is deactivated. 80% of water-cooled torch repairs are due to compromised water-cooled power cables because of the lack of water flow. Most of the time this is ends up being an expensive repair. This new standard feature form American Weldquip, along with an anti-stretch cord to prevent pulling apart of cable assemblies, help end-users avoid costly repairs and downtime.